What personal information does Whole Circle Farms, Inc. collect and when? We collect and store information that you enter into this website. Information will be collected when you register on our website, if you sign up to receive emails, newsletters or other promotional communications, if you contact us with online inquiries and/or when you otherwise voluntarily submit or provide information to us. The information we collect that you provide to us may include, but is not limited to: names, addresses, email addresses, telephone numbers, account and log-in IDs, passwords, demographic information and information regarding interests and preferences. How does Whole Circle Farms, Inc. use your information? Information collected is used to provide communication regarding products and services and for administrative and analytical purposes. For example, the information is used to provide emails, newsletters and other communications you have requested and to provide customer service. This information also may be used to contact you about sales, product recommendations, special offers and new site features from wholecirclefarms.com, unless you have opted not to receive promotional communications in connection with this website. When you opt not to receive emails, newsletters or other promotional information, we collect and store certain information, such as your email address, in order to comply with your preferences regarding such materials. 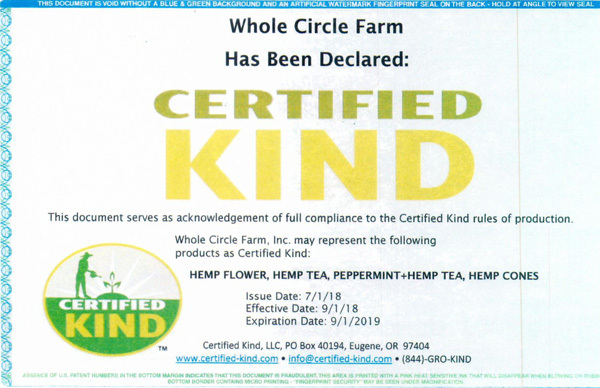 How does Whole Circle Farms, Inc. protect customer information? Our SSL security includes forcing all site traffic and users to use HTTPS and SSL, and all server and CDN traffic uses enforced SSL as well. 18514 S. Abiqua Rd NE.